Dare I say it? OK, I’m going for it: Spring is here! 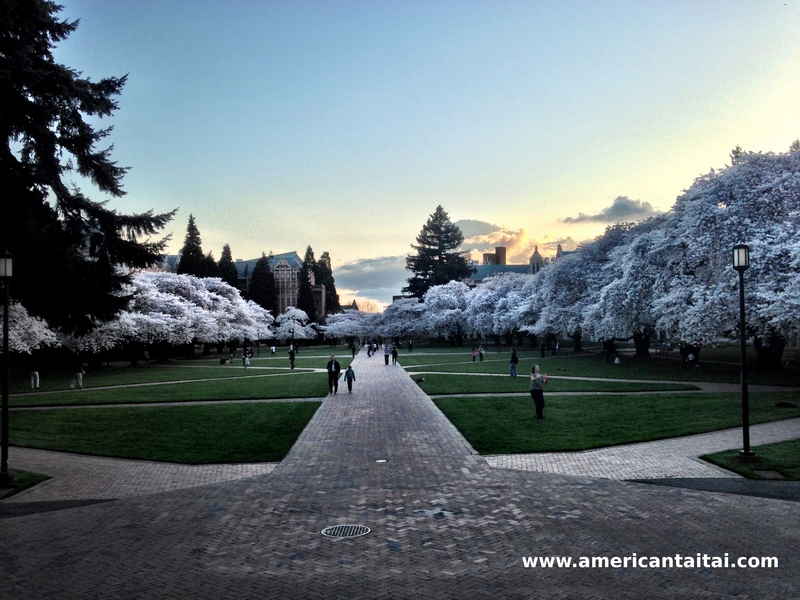 Anyhow, to take advantage of the lovely sunsets (and the fact that it’s spring break,) DH and I went to visit the old stomping grounds yesterday evening to see if we could catch the blooming cherry blossoms in the Quad at the University of Washington. Our timing was perfect and we were not disappointed. 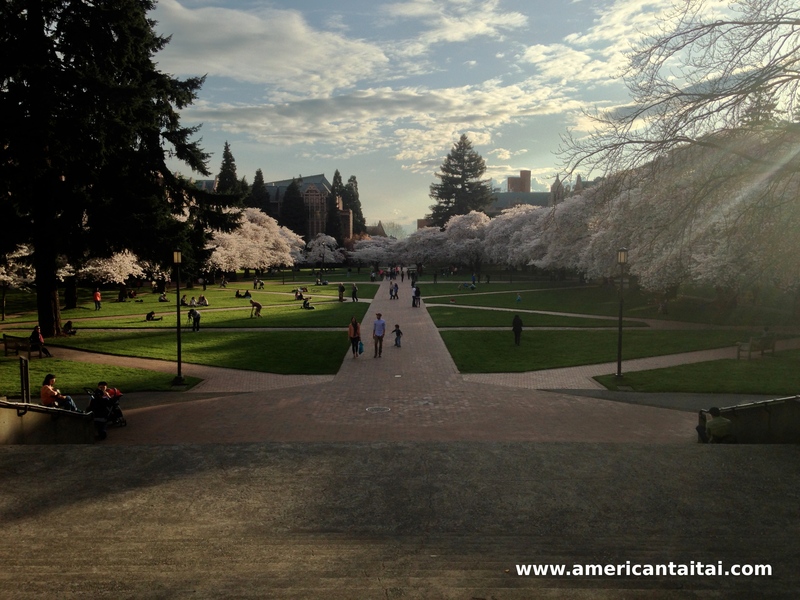 Back when I was a student, I always thought spring was the most beautiful (albeit not necessarily the most productive) quarter on campus. And even now, I still find it ironic that the cherry blossoms always seem to reach full bloom while most students are away on spring break. But I’ll take it and chalk it up to yet another perk for Seattle residents. 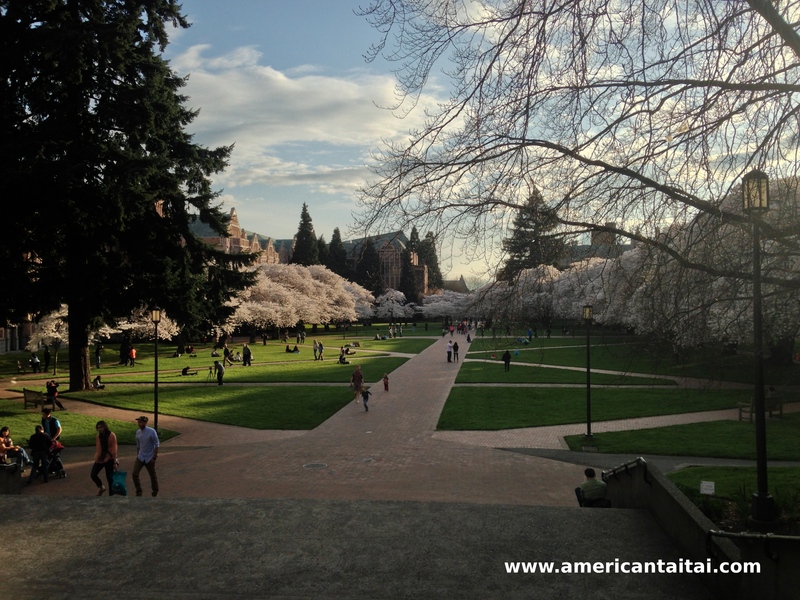 I know the Quad isn’t exactly Kyoto or even Washington DC, but it’s still quite magical. Part of the magic is the temporal nature of the blossoms, as they only bloom for about a week or so before dusting the ground as white and pink petal snow. I’ll be honest since DH and I both found ourselves waxing nostalgic as we were taking in the scene at the Quad last night. I thought about how we probably unknowingly passed each other many times all those years ago between classes—back in the grunge heyday of Doc Martens and over-sized plaid flannel. We were simply one of the thousands of undergrads who didn’t know of each other. Not surprising to those of you who attended a large state school, but I still find it kind of amazing that we happened to find each other so many years later. Intellectually, I know I’m older. But sometimes I don’t really feel like a real grown up—which in my book, is a good thing most of the time. It’s only when I see the current undergraduate students on campus and realize how painfully young and innocent they all look that I really start to feel my age. Did I ever look like that, with the fresh-faced starry-eyed look? How long ago was it? And since we’re indulging in nostalgia today, here’s a favorite that takes me straight back to college. Yes, I’m dated, but I’m OK with that. I’m embracing it. Short post today because I’m hoping that you’re not in front of your computer but outside enjoying the gorgeous sunny spring day! 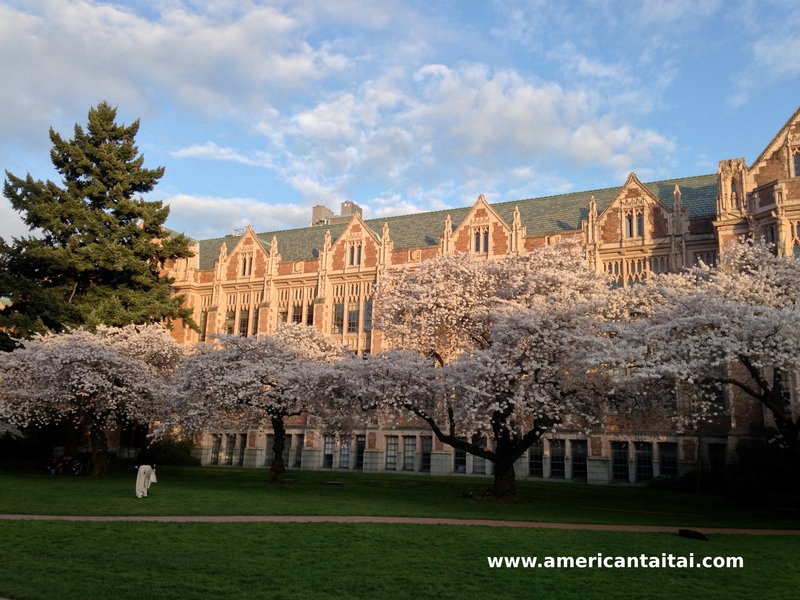 And if you happen to be in the Seattle area this weekend, consider checking out the cherry blossoms in the Quad. Oh, and bring your camera. You won’t be disappointed. Thanks Jen! Was kind of feeling nostalgic. Ooooh Thailand for Easter Break! Have a great trip, and glad you’re able to get out of the rain! Beautiful pictures, Angela! But I do disagree with you, I’ve experienced plenty of lovely spring days in Seattle (long before 4th of July!) – I remember taking our motorcycle for a ride to the Olympic Peninsula as early as March. I am glad to see that this year spring is gorgeous again! The Quad! So beautiful and a sign of spring for us in the PNW. Headed that way soon. Thanks for stopping by Rachelle! 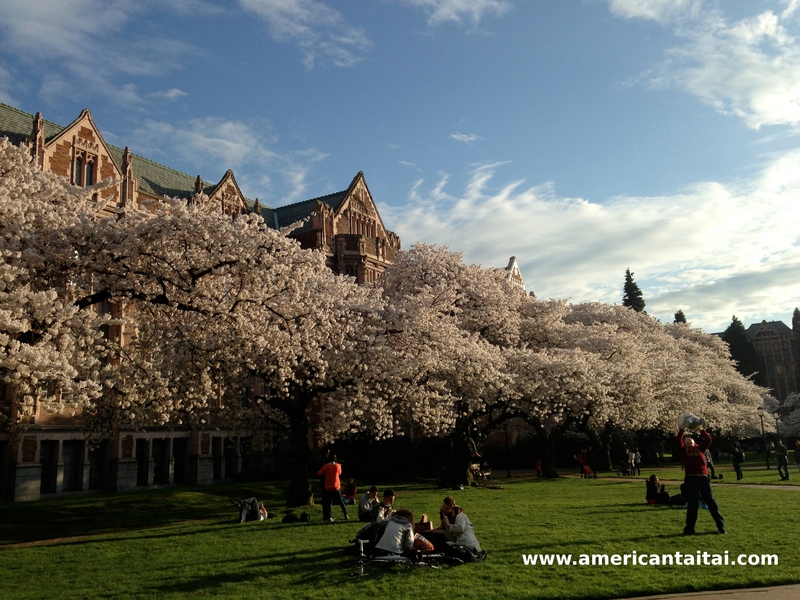 Hope you enjoyed the blossoms and the amazing sunny day yesterday! We are lucky to live in this beautiful part of the country. BEAUTIFUL!! Wish we had been there to see it with you. Wish you guys were here to see it as well! 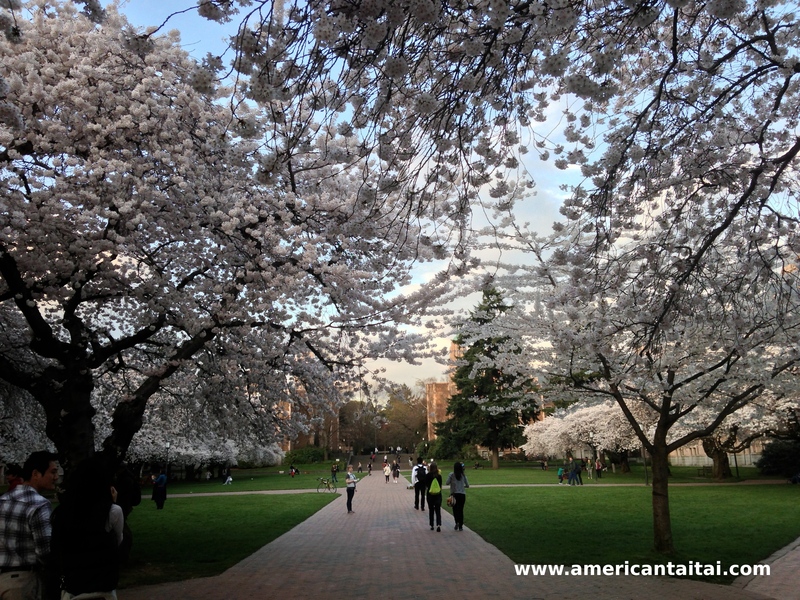 While the cherry blossoms at the UW are about 20 years younger than the ones in DC, they are of a similar vintage.